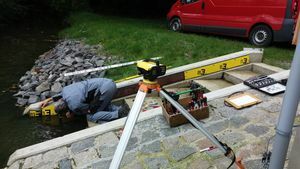 One of our areas of responsibility is also the installation of the measuring technology at your site. After a detailed consultation, our qualified technical personnel will transfer the offered measurement technology with the help of installation guidelines and installation templates in the building. A secure anchoring in the building guarantees measured values over the years. To attach the measuring technology in the building we use only stainless steel. We also pay close attention to the installation tool. This is also a crucial factor for a clean and successful installation. Customer-oriented service is always very important in our company. Our assembly services are also appreciated by foreign companies abroad. We also install their measuring technology worldwide. Do you have questions about the installation of measuring technology or other services? Call us, we are happy to help you easily.